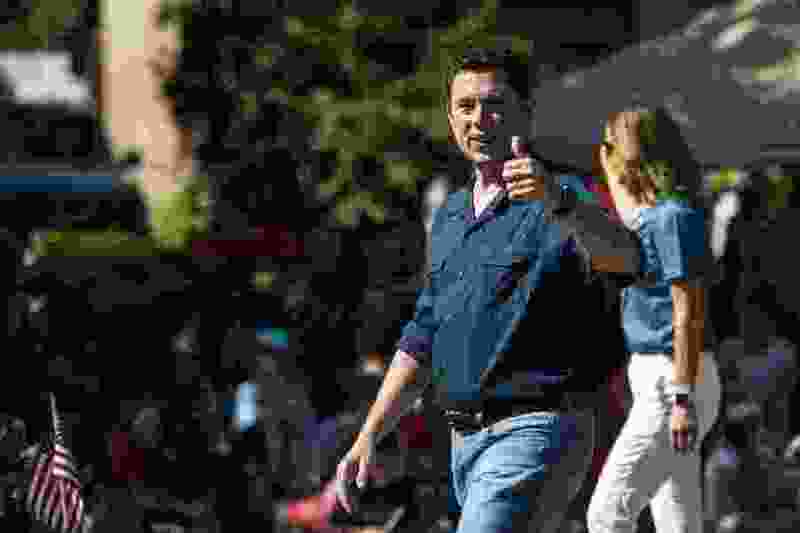 (Chris Detrick | Tribune file photo) Congressman Jason Chaffetz give a thumbs-up to the crowd during the annual Freedom Festival Grand Parade in downtown Provo, Monday, July 4, 2016. Washington • The bad guys in former Rep. Jason Chaffetz’s new book, “The Deep State,” are not a surprise: federal government bureaucrats. The good guy? Chaffetz himself, of course. The book, “The Deep State: How an army of bureaucrats protected Barack Obama and is working to destroy Donald Trump,” is 223 pages of Chaffetz’s contempt for federal workers he assails as going against America’s Founding Fathers’ goal of limited government and trying to undermine elected officials. The book, set for release Sept. 18, is largely drawn on Chaffetz’s time in Congress, especially the years he spent as chairman of the House Oversight and Government Reform Committee. He declined to say how much the book deal is worth. Chaffetz, who resigned from Congress six months into Trump’s presidency, writes about his exasperation with federal workers during Obama’s time in office and how he felt stonewalled by bureaucrats on requests for documents and pushback on gathering information that he felt should be made public. And he details well-publicized cases of government workers who truly messed up — and were caught doing so — as well as his battles with the IRS, Transportation Security Administration and the Secret Service. The book begins with Chaffetz’s investigation into the Sept. 11, 2012, attack against a U.S. consulate in Benghazi, Libya, and the congressman’s frustration with being shadowed by a State Department attorney on a trip to the country a month after four Americans, including the U.S. ambassador, were killed there. The State Department minder, Chaffetz says, would “contribute nothing” to the fact-finding mission. “He is a State Department lawyer who specializes in Freedom of Information Act requests — or, more specifically, how to keep information hidden from the public … and from a congressman,” Chaffetz writes. That trip, he says, turned up details the Obama administration didn’t want discovered and led to more congressional inquiries and eventually a special House committee to probe the attacks. It also yielded a very important detail about then-Secretary of State Hillary Clinton. Chaffetz also attacks the Justice Department, calling it a “pillar” of the Deep State, offering instance after instance of actions he finds troubling, from the “Fast and Furious” gun program that led to the United States giving thousands of weapons to Mexican cartels to what he believes was a botched investigation of Clinton’s emails. Maryland Rep. Elijah Cummings, who was the top Democrat on the Oversight Committee during Chaffetz’s tenure, responded to the new book by noting that the Utah congressman was dogged in investigating possible government wrongdoing during the Obama administration, but the GOP-led committee has largely ignored its role now with a Republican president. “Taking abusive and unconstitutional actions; denying accountability and responsibility; becoming angry when questioned; the inability to coherently defend oneself — frankly, these traits all sound like President Trump,” Cummings said. A Publisher’s Weekly review of the book notes that most of the tome “recounts bureaucratic obstruction of Chaffetz’s committee work during the Obama administration” and paints bureaucrats as trying to protect the Democratic president from any oversight. “Chaffetz’s ‘deep state’ dudgeon is overheated — his subject’s main crimes seem to be incompetence and dodging blame, not subversion — but his critique of executive branch corruption and secrecy is cogent and timely,” the review concludes. Chaffetz, who left his congressional seat to take a job at Fox News and write his book, wasn’t always a Trump defender. Shortly after the “Access Hollywood” tape — wherein Trump is heard talking in lewd and explicit terms about women — emerged in fall 2016, Chaffetz said he could not endorse Trump or wouldn’t be able to look his 15-year-old daughter in the eye. In the book, Chaffetz casts Trump as the “ultimate disrupter and rule breaker” and describes bureaucrats as revolted that he won. Chaffetz also took the opportunity in the book to castigate the TSA with his telling of a story when he had a “major run-in” with agents at the Salt Lake City International Airport. He had been in line for metal detector screening to avoid the body scanning machines he had fought against. At the time, Chaffetz had just voted against allowing TSA’s union to use collective bargaining.